Panda 4.0 arrived in late May with a fury not seen by many previous updates. It was a HUGE update and many sites were decimated by P4.0. Most businesses reaching out to me after the May 20 update saw drops of 50%+, with some losing 80% of their Google organic search traffic overnight. And on the flip side, recoveries were strong too. There were some companies I was helping with past Panda attacks that saw increases of 200%+, with some seeing over 400% increases. Like I said, everything about Panda 4.0 was big. A few weeks ago, I was analyzing a Panda tremor and saw some very interesting movement across sites I have been helping. More to come on that front, but that’s not the focus of this post today. That same day, a business owner reached out to me explaining that he saw serious fluctuations on a site of his that was crushed by Panda 4.0. Needless to say between what I was seeing, and what he had just explained, I was interested for sure. So I asked how much of a recovery he saw during the latest Panda tremor, and what I heard shocked me – “Close to a full recovery.” Whoa, not many have recovered from Panda 4.0 yet, so now he had my attention. Since my schedule has been insane, I didn’t have time to dig in too much at that point. I was planning to, but just couldn’t during that timeframe. So to quickly recap what happened, a site that got crushed by Panda 4.0 ended up recovering during a Panda tremor (in late July), only to get hammered again five days later. By the way, it was a near-full recovery during the five day stint (regaining 75% of its Google organic search traffic). In addition, I’ve been analyzing other Panda 4.0 sites that were impacted during the late July 2014 update (which I plan to cover in future blog posts). It was big tremor. It’s worth noting that I have seen other Panda victims see increases in Google organic traffic during the recovery phase (almost like the site is being tested). I’ve seen this during Panda work since 2011. I’ll explain more about that phenomenon soon, but I wanted to bring it up now since this site did see a temporary recovery. If you know me at all, you know what came next. I fired up my Keurig and dug into the site. With a cup of Jet Fuel and Black Tiger in me, I wanted to know all I could about this interesting Panda 4.0 case study. In this post, I’ll explain more about the temporary recovery, the factors that led to the Panda hit, why I think the site saw a temporary recovery, and end with some key learnings that are important for any business owners dealing with Panda 4.0 attacks to understand. Let’s go. Although I want to focus on the temporary recovery, let’s quickly cover the initial Panda 4.0 hit. The site is small, containing less than 60 pages indexed. It’s a site covering an extremely focused niche and it’s a partial match domain (PMD). After analyzing the site, here are what I believe to be the core factors that led to the Panda hit. Looking through the history of the site reveals an increase of content in 2013 and much of the site content became affiliate-driven. The site was heavily linking to Amazon.com for products tied to the niche (and some were followed affiliate links). So there was a lot of traffic arriving on the site that was quickly going out. That’s never a good situation from a Panda-standpoint. Also, the other content funneled visits to the affiliate pages where the site could have a greater chance at converting those visits into potential sales down the line. And of course, you have followed affiliate links, which should be nofollowed. I can’t tell you how many affiliate marketers have reached out to me after getting smoked by Panda since February of 2011. If you aren’t providing a serious value-add, then there’s a strong chance of getting crushed. I’ve seen it a thousand times. That’s a nice segue to the next factor – engagement. I’ve mentioned many times in Panda blog posts the importance of strong engagement. Google has several ways to measure user engagement, but one of the easiest ways is via dwell time. If someone clicks through a search result on Google, visits a page, and quickly clicks back to the search results, that’s a pretty clear signal that the user didn’t find what they wanted (or that they didn’t have a positive user experience). Low dwell time is a giant invitation to the mighty Panda. Checking standard bounce rates for top landing pages leading up to the Panda attack revealed extremely high percentages. Many of the pages had 90% or higher bounce rates. I wish the site had implemented Adjusted Bounce Rate (ABR), but it didn’t. 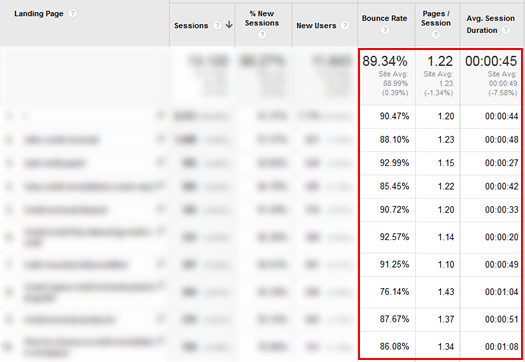 ABR is a much stronger view of actual bounce rate that takes time on page into account. That said, many top landing pages with 90%+ bounce rates is not good. The site itself did not help build credibility. It was a basic WordPress design with little credibility-building factors. There weren’t clear signs of who ran the site, which company owned the site, etc. It was basically a shell WordPress site that you’ve seen a million times. The “About” page was just a paragraph and doesn’t inform the user about who was actually writing the content, who was behind the site, etc. By the way, I find about pages like that to make matters worse, not better. In addition, there were several pages with broken html, where some html was showing up on the page itself (like html tags). When you are trying to drive strong engagement, trust definitely matters. The less people trust the site and the company behind the content, the less chance you have of retaining them. And again, the more users that jump back to the search results, the more virtual bamboo you are piling up. During my analysis, I found ads throughout the content that were very similar in style and design to the content itself. So, it was easy to think the ads were the actual content, which could trick users into clicking the ads. I’ve seen this a number of times while analyzing Panda attacks (and especially Panda 4.0.) In addition, this is even called out in the latest version of the Quality Grader Guidelines. I’ve found deception to be an important factor in recent Panda hits, so ads that are cloaked as content can be extremely problematic. Remember, SEOs and digital marketers might pick them up pretty quickly, but we’re not the majority of users browsing the web. Think about what the average person would do if they found those ads… Many would have no idea they were ads and not content. And they sure wouldn’t be happy landing on some advertiser’s website after clicking them. Mixed throughout the content were many exact match anchor text links (EMATs), either pointing to the affiliate pages mentioned before or to off-site authority sites. For example, a typical landing page would link heavily to the Amazon pages, but also to Wikipedia pages. I’ve seen this tactic used in the past as well with other Panda and Phantom victims (and I’ve even seen this during Penguin analysis). Typically, the thought process is that if Google sees a site linking to authority sites, then it might trust that site more (the linking site). But it also creates a pattern that’s easy to pick up. It’s not natural to continually link to Wikipedia from many places on your site, and Google’s algorithms can probably pick up the trend when it takes all outbound links into account. And that many of the links are exact match anchor text doesn’t help (since the links throughout the pages tended to look over-optimized and somewhat spammy). 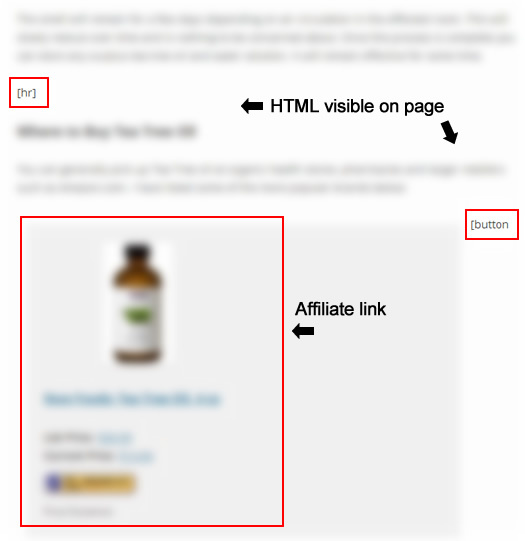 While analyzing the site, I noticed many of the top landing pages had authorship implemented. But when checking out the author, I got a feeling he wasn’t real. Sure, there was a G+ profile set up, and even other social accounts, but something didn’t feel right about the author. And using reverse image lookup in Google images, I pulled up the same photo being used elsewhere on the web. In addition, it looked like a stock photo. The one used on the site I was analyzing was cropped to throw off the look (which helped make it look more unique). So, if I had questions about the author, you better believe Google must have too. And add questionable authorship to the other factors listed above, and you can see how the credibility factor for this site was pushing it into the gray area of Panda. The author in the photo might as well been holding a piece of bamboo. Below, I’ll quickly detail what happened as the site experienced a roller coaster ride across the giant Panda coaster. Index status revealed a doubling of pages indexed leading into 2014. My guess is that more content was added to cast a wider net from an affiliate marketing standpoint. And again, many of those pages had affiliate links to Amazon to buy various products. That new content worked (in the short-term). Google organic traffic increased nicely on the site. Then the site experienced the misleading and sinister surge that I wrote about in my Search Engine Watch column. In March of 2014, the site spiked in Google. Many different keywords related to the niche were driving traffic to the site. But unfortunately, that traffic was all leading to the problems I mentioned earlier. The surge I mentioned enables Google to gain a lot of engagement data from real users. And if you have content quality problems, usability problems, ad problems, etc., then you are feeding Panda a lot of bamboo. And that can easily lead to a Panda attack. And that’s what happened during Panda 4.0. The wave crashed and the site lost 86% of its Google organic traffic overnight. Yes, 86%. Many of the keywords that the site picked up during the surge were lost during Panda 4.0. The landing pages that were once driving a boatload of organic search traffic dropped off a cliff visits-wise. One page in particular dropped by 96% when you compared post-Panda to pre-Panda (with 30 days of data). That’s a serious hit and speaks volumes about how Google was viewing the website. While analyzing the keywords that dropped, it was interesting to see that the site’s money keyword was not impacted at all during Panda 4.0 (or even the second hit which I’ll cover shortly). That keyword, which is also in the domain name, stayed as-is. It’s hard to say why that was the case, but it was. Checking trending throughout the roller coaster ride reveals steady impressions, clicks, and average position. Then along came Tuesday, July 22. The site absolutely spiked with what looked to be a near-full Panda recovery. The site jumped up to 75% of its original traffic levels from Google organic. Checking the keywords that surged back, they matched up very well with the keywords from pre-Panda 4.0. There was clearly a Panda update pushed out, although it was hard to say if it was a Panda tremor (minor tweaks) or something larger. It’s worth noting that I saw other sites dealing with Panda 4.0 hits show serious movement on this day. For example, one large site saw almost a full recovery (from a major Panda 4.0 hit). July 27, 2014 – It was nice while it lasted. Well, that was fast. It seems yet another Panda tremor came rolling through and the site lost all of its gains. I’ll cover more about that shortly, but it’s important to note that the site dropped back to its post Panda 4.0 levels. So, the temporary recovery lasted about 5 days. That’s a tough pill to swallow for the business owner, but taking a look at the situation objectively, it makes a lot of sense. This situation underscores an important point about Panda recovery. You need to make serious changes in order to see long-term improvement. Band-aids and lack of action will get you nowhere. Or worse, it could yield a misleading, temporary recovery that gets your hopes up, only to come crashing down again. Let’s explore the temporary recovery in more detail. I mentioned earlier that I’ve seen Panda victims experience short bumps in Google organic traffic during the recovery phase. I even documented it in one of my Panda recovery case studies. It’s almost like Google is giving the site a second chance, testing user engagement, analyzing the new traffic, etc. And if it likes what it sees, the recovery could stick. In the case study I just mentioned, the site ended up recovering just a few weeks after the temporary bump occurred. So, will this website experience a similar recovery? You never know, but I doubt it. The site that ended up recovering long-term made massive changes based on a deep Panda audit. They should have recovered (even quicker than they did in my opinion). The site I just analyzed hasn’t made any changes at all, so I doubt it will recover in its current state. I’ll end this post with some key learnings based on what I’ve seen with Panda recovery, tremors, etc. If you are struggling with Panda recovery, or if you are helping others with Panda recovery, then the following bullets are important to understand. Google can, and will, push out minor Panda updates (which I call Panda tremors). Sites can recover during those updates to various degrees. For example, I saw a large-scale Panda 4.0 victim experience a near-full recovery during the July 22 update. Small websites can get hammered by Panda too. I know there’s often a lot of focus on large-scale websites with many pages indexed, but I’ve analyzed and helped a number of small sites with Panda hits. Panda is size-agnostic. When websites stir up a serious Panda cocktail, it can experience a misleading surge in traffic, followed by a catastrophic Panda attack. Understanding the factors that can lead to a Panda hit is extremely important. You should avoid them like the plague. Once again, I found deception and trickery contribute to a Panda hit. Cloaked ads, questionable authorship, heavy affiliate linking, and more led to this Panda attack. If you deceive users, expect a visit from the mighty Panda. And no, it probably won’t be pleasant. In some situations, money terms may not be affected by panda. In this case study, the core money term was not impacted at all. It remained steady throughout the ups and downs. But as documented above, that didn’t stop the site from experiencing a massive drop in Google organic traffic (86%). First, I’m glad you made it to the end of this post (I know it was getting long). Second, I hope you found this Panda case study interesting. It was definitely fascinating to analyze. I’ve helped many companies with Panda attacks since February of 2011 and this case had some very interesting aspects to it. As usual, my hope is this situation can help some of you dealing with Panda attacks better understand the fluctuations you are seeing over time. Panda can be a confusing topic for sure. If there are few core things you should remember leaving this post, it’s that temporary recoveries can happen, implementing the right Panda changes over time is extremely important, Google can test your site during the recovery phase, and organic search traffic can come and go like the wind. Just make sure you’re ready when the Panda comes knocking.